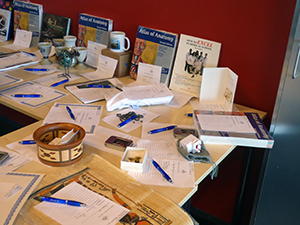 As you may know, IAMSE conducts a silent auction at the annual meeting each year. Because the format of our Gala Dinner has changed slightly this year, we will instead hold a raffle of donated items. The purpose of the raffle is to raise money to fund scholarships for attending the annual meeting. It is important to support and foster the interests and scholarly activities of the younger generation who will one day step into our shoes. We hope this year’s event will be even more successful than before. How you can help: Please consider donating items that would be appealing to our members. Even if you are unable to attend the meeting this year in Roanoke, you can still participate! Pleasecontact our office regarding the items you would like to donate. graphic supplies, lab supplies, lab or service bureau gift certificates, retail gift certificates, medical or photographic antiques, collectibles, handcrafted items, promotional items from suppliers, mugs, t-shirts, caps, etc. from your institution/state/country, food, wine, or specialties of your state/region/country, vacation homes to be used for a week, and airline miles. Please let us know which item(s) you would like to donate by emailing support@iamse.org. Thank you for considering your contributions to this important endeavor. We look forward to seeing you in Roanoke!